The Certificate. Photo taken by Kell Davis-Gluyas courtesy Yvonne Gluyas. WHY WOULD YOU WANT TO GO BACK TO UNI? When I decided, as a single mother of two young sons, to apply to study for a Batchelor of Arts Degree in Communications at the University of Technology in Sydney in the mid 1980s my decision was met with scorn and bewilderment. “Why would you want to give up your job just to go to uni?” asked one puzzled member of my working class family. “Don’t you think you are a bit too old for all that?” asked another. Three years later I graduated…. My then seven year old son, Kell, loudly called out to ask, “What did you get?” as I proudly left the stage with my embossed certificate…. 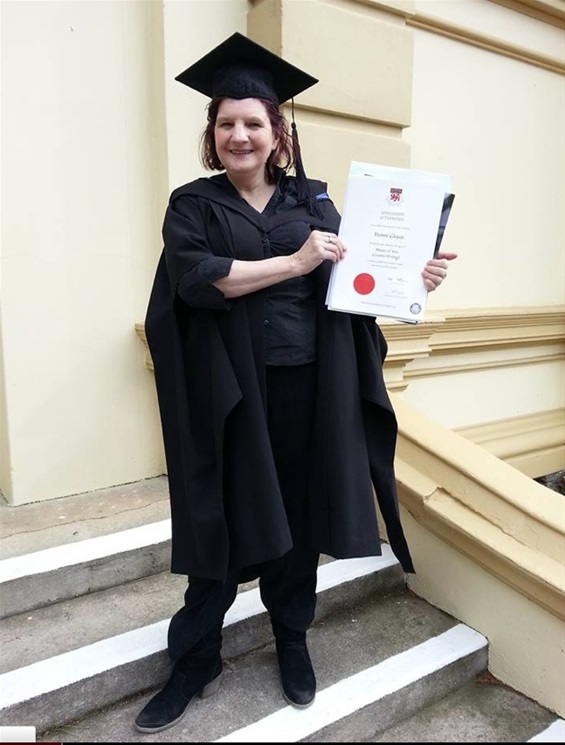 This degree gave me an introduction to opportunities I never even knew existed, including a move to Tasmania, years of work in China, a vast improvement in my writing, and many friends in the world of books and words. Two years ago, twenty-five years after my first graduation and now with four kids well and truly grown up, I was handed a slip of paper. “Want to do a Masters Degree in Creative Writing at the University of Tasmania?” it asked. Without even thinking of the reasons why this was a crazy idea, and discounting the fact that I was now maybe a little too old for all that, I realized that that was EXACTLY what I wanted to do. I squeezed into a crowded information session, standing room only, ignored the fact that only a dozen would be selected to do the course, and applied. To my absolute amazement I was accepted. Then I discovered that, along with doing critical text analysis, I was expected to write a novel. Not a genre that I had attempted before…. “Write about what you know” we were advised… The other bright and clever students wrote wonderful, carefully crafted pages about prisoners of war and travel and unicorns and dragons and family crisis and murder and boarding school and all that…. I thought maybe I should give up and take up crocheting instead … but thanks to the wonderful guidance and feedback from my lecturer, Rohan Wilson, and my eleven classmates, I took up the challenge to use fiction as a way of bringing the past back to life. I started to write about Sydney in the mid to late sixties, which was a time of change, particularly around the issues of conscription and Australia’s increasing involvement in the Vietnam War. My historical fiction reflects those times and shows what happens when a disparate group of people are drawn together under the banner of protest and opposition to that war. One thing I learnt was that when I disappeared into my study for hours of research and writing I wasn’t just hiding. I had validation. I was doing uni work!